I first met E. E. Cummings’ classic love poem as a student in a high school literature class. What made a significant impact on me, almost as much as that perfect description of profound love, was that in a class where broken grammar rules could cost me a perfect “A” on a paper, I was introduced to a writer who not only flaunted language rules, but was exalted for it. The difference between mistake and craft, I learned, could be intention. A writer transports a reader with language, transforms the small world within the walls of our individual human experience into a kaleidoscope as big as the universe of all the possibilities this life might hold. We construct tiny snow globes, lay them on a giant digital shelf and beg anyone to please engage with us. That’s another one of my favorite lines from the E.E. 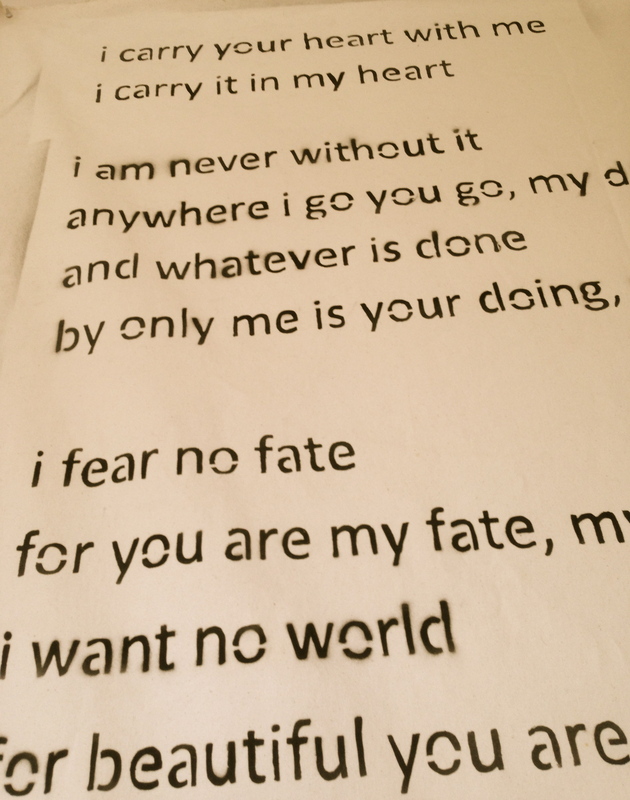 Cummings poem,”i carry your heart with me”. Here is one of my deepest secrets. I truly hate the end of each semester. I always think I’m forever saying goodbye to you students who I’ve gotten to know through words, both spoken and written. I hate goodbyes and I hate not knowing for sure that I gave you enough. I always wish I had another hour or two, another week or more, to pass along some tidbit of rhetorical technique we never got around to covering. Would you become more effective writers if we practiced spotting faulty logic? Could I have worked harder to find more diverse voices for you to read from? Should I have forced you to remember everything we talked about by adding quizzes to the syllabus? The end of the semester for me is a torment of “All The Woulda-Coulda-Shouldas” as Shel Silverstein wrote in Falling Up. Oh, we had more than “One Little Did.” Actually, it was more like 10,000. Yes, we wrote more than 10,000 words. We read. We crafted. We drafted. Composed. Created. We closely observed how writers use language to compose a self, to create on new media, to say what we really mean. We experimented with poetry and prose, with research and structure and voice. We created manifestos about our beliefs and our theories of writing and living. I teach because I believe with the conviction of a person who holds a job with one of the lowest-paying ratios of salary compared to level of higher education, that there is absolutely no better way to spend my days than in the company of young minds on the cusp of taking over leadership roles in government, businesses, medical fields, educational and cultural institutions, and families. At the end of my life I want to honestly say I did all I could to pass along knowledge which might empower and uplift humans, that which might lead to justice and dignity for all. I teach you because you always teach me. Be persistent. Try more than you will master. Succeed humbly. Be funny. Be kind because someone always has more going on behind their smile than you might ever imagine. Be brave and try something new. You are one of 19.9 million students enrolled in a degree-granting institution, according to a recent report by the National Center for Education Statistics. That number represents the population of the entire state of Florida. You students are as unique as your speaking voice, an utterance so individual that audio voiceprints are as singularly identifiable as fingerprints. Learning to effectively wield words, using your own unique writing voice, is learning how to construct a reality. Our words transform the world we inhabit. 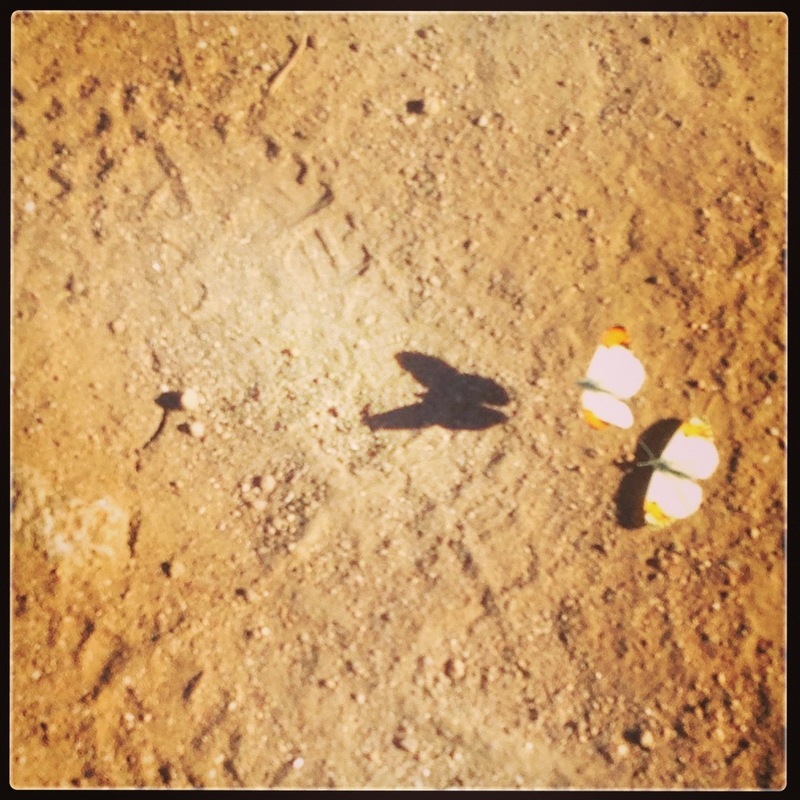 Two Sara Orangetip butterflies leaving a shadow of outstretched wings on the brown dirt of Orange County’s Bell Canyon Trail. A writer can give you butterfly wings on a path, or a writer can give you nothing. What will you do with all that power? Catherine Keefe is a human being writer, teacher, writing coach. Her poetry, creative nonfiction essays, interviews and book reviews have appeared nationally. This entry was posted in Manifestos and tagged Catherine Keefe, E.E.Cummings, students, truth, voice, writing. Bookmark the permalink.